Two hundred and fifty years ago in Salzburg, was born Wolfgang Amadeus Mozart. In a brief 35 year span, he composed enough music to last us all a lifetime – many times over. In my bachelor days I took every opportunity to attend symphonies. A collection of his music was the first CD I ever purchased. But his musical genius could not stand the force of the Indian naari – M. Overnight, Mozart was deposed and replaced by Dandia Mix, Dance Masti and Kantaa Lagaa. My Western classical CD collection is collecting dust (or possibly water logged) in our basement. I now find solace in Sudhir Phadke&apos;s Geet Ramayan, or other bhajans with the theme of surrendering to God. What else is left to do in life? 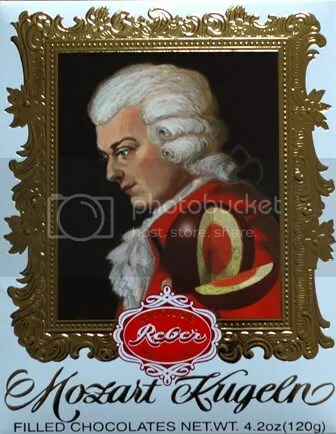 But when she takes, she gives generously too: One of her Austrian colleagues gifted her a box of Reber’s Mozart Kugeln. Each kugeln is the size of a medium ladoo, bundled in gold foil with the portrait of Mozart. I gently peel the foil – which I will later smoothen and use as a bookmark – and pop this dark ball in my mouth. Its an uncomfortable size and I nudge it to one cheek, and then roll it over to the other. I savour the bitter chocolate residue on the inside of my cheeks. Seeking more of this taste, I switch the ball between cheeks and occasionally letting it rest on my tongue. By now my taste buds have surreptitiously caused my salivary glands to drench the chocolate ball and my lips purse, ensuring the melted chocolate does not dribble out the side of the mouth. As I squeeze, I can feel the ball &apos;give&apos; and a trickle oozes out. My tongue traces this gooey source and the pistachio-almond marzipan laced with hazelnut, causes an explosion in my brain! My eyes widen and then clench shut, hoping somehow to lock the taste in my brain. As the wave passes, subconsciously my tongue traps the leftover ball to my palate and squeezes. More of the filling trickles at first and then gushes out. My eyes smile wide, my ears are warm red and goose bumps travel down my spine. My tongue squeezes the deflated chocolate ball further, but it has already yielded its all. In a frenzy then, my tongue mercilessly drives the leftover chocolate shell between my grinding teeth – first to one side, then the other. And in a matter of seconds the covering is shredded and melts away in the abyss. Unsatiated, my tongue seeks all traces of chocolate in each crevice of my teeth, gums and cheeks. Done! Instinctively I reach for another of the gold foil covered kugeln. Whack! My fingers freeze midway. I groan and reach for the water instead. Jism plays on the stereo!